Several years ago, people bought drones with only one purpose, to use them for making aerial footage. Nevertheless, the situation changed these days. You’ve probably heard about the possibility to use drones for delivery purposes, in the agricultural area and lots of other industries. Besides, it could be easier for the rescue teams to monitor beaches with the help of drones. Because of the fact that the drone market is going to be more and more popular, such countries as China, Korea and Japan are going to expand their markets. Well-known drone manufacturers are going to turn their eyes to the new markets. DJI, the leading drone manufacturer, based in China, turned its attention to the agricultural drones. Since 2016, DJI is regarded to be the leading company, specializing in producing non-military quadcopters. These days, the drones and accessories produced by DJI are extremely popular among users. The company’s annual profit is around US$1,5 billion. After the release of a well-known Agras MG-1 – an octocopter, which can be used in the agricultural area, DJI increased the amount of its targeted audience. At first gaze, this is an ordinary drone, but it can carry 15 kg of liquid. Its prime objective is to simplify the work of farmers. Besides, the vice president of DJI confessed that DJI considers the agricultural area to be the future of the drone business. Several Japanese drone companies united and now they are working on a new drone patrol service, which can be useful for officers. 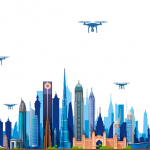 Such companies as Taisei, a Nagoya-based construction company, Blue Innovation, a Tokyo-based drone startup and NTT East , a well-known telecom company united and launched T-Frend – a cool drone-based monitoring service. Together the companies are going to install a high-capacity network, which will provide hardware and many flight control systems. The prime objective of drones, released by these companies is to be night guards that will monitor the offices after business hours. The drones will be recording videos of offices. As a result, one can view these video files from the cloud services where they will be transmitted. This functionality allows the building managers to check the data either in the real time mode or online. The drones are also endowed with special sensors, allowing them to avoid obstacles. Clients can use these drones with the aim to prevent the information leakage, which is regarded to be a real problem for huge corporations. The Korean Advanced Institute of Science and Technology represented a fireproof spider-man drone. Its name is Caros or Climbing Aerial Robot System. It first gaze, it doesn’t differ from an ordinary drone. Nevertheless, the drone is endowed with the functionality, allowing it to attach to surfaces and inspect it like Spider-Man. The drone’s sensors can easily detect the required information and even map 3D environment. Another purpose of Caros usage is being a fireproof rescue drone. The technology of this drone can be used as a surveillance robot. The aircraft can easily go through narrow environments. Besides, it can change its modes easily depending on the operation the drone needs to perform. Besides, it is possible to equip Caros with a thermal camera (if necessary). As you see, the drone market is rapidly developing and very soon these flying machines will be engaged in more industries. If you don’t know where to use drones, you can read this article.